Nightingale Gardeners Group is a new constituted group enabling community gardening at Nightingale Community Garden. This is a former bowling green in the corner of a City Council park. It is part of an RHS-affiliated Queen Edith's in Bloom network in the Queen Edith's area of South Cambridge. 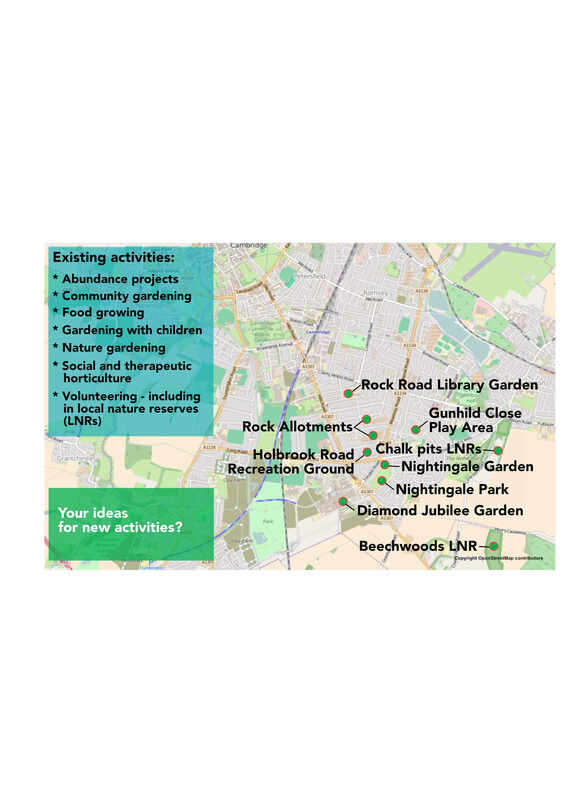 The Bloom projects include Greening-Grey-Britain-funded raingardens but we also network with local allotmenters, another community garden attached to a library and a primary school garden project. The garden is open every day, at least from 10am to 3pm in winter months (September to Feb) and to 6pm in the summer (March to Sept). We have a gate rota by volunteers and try to keep it open for as long as possible but keep it locked in the dark. We can arrange to meet people there for other hours. Nightingale Garden is in a former bowling green in one corner of Nightingale Park, which is on Nightingale Avenue, near to Addenbrooke's Hospital in South Cambridge. The approximate postcode is CB1 8SG. There is a small car park by playground and the garden is to your right along a short path.